I was told that having more cards and more open accounts was more of a risk factor since you have more credit to abuse. However, this seems to say otherwise that credit trackers actually encourage you open and have more accounts to show trust and have more open accounts. Should I open more accounts with no annual fees just to have them? Right now my credit is at 724 but I want to reach 750+ before getting a student loan. In the long run, yes. In the short term, no. Having more accounts and higher total credit limit is a good thing. From the potential lender's perspective, someone else has apparently reviewed your profile in the past and decided that you were creditworthy. However, building credit account numbers should be a gradual process, just like accumulating the credit history. If you apply for quite a few credit cards in a very short period of time, it would look really bad to lenders because it makes you look desperate and risky. Unless of course you don't have an immediate need for credit and would simply like to focus on building credit history along with account numbers. In your situation, since you have a need for credit and would like to see a better score in the short term, the most effective approach is simply to reduce your credit utilization. You would notice that total account number has a low impact on your credit score, but credit utilization has a high impact. Pay off your credit card balances in full if you can, and you will see that score taking off. EDIT: (Per @Mindwin's suggestion) here is how applying for/opening new accounts shortly before seeking approval of a new loan hurts you. Your score already reflects the number of inquiries, but lenders could also look closely at your credit inquiries and decide that you are more risky than what the score would imply. I'm not sure if FICO/Vintage credit score models take into account this factor, but I know lenders would sometimes look at credit history to see how many accounts you have successfully opened recently and use it as another indicator of how aggressive you are in seeking credit in the recent past. Probably the most infamous example of this is Chase's 5/24 rule. Both of these are negatives, more than offset the benefit you get from having a higher total credit limit and account numbers. So you want to avoid doing that before applying for loans. In the long run, these things don't matter as much, and pros outweigh cons. No, don't open more accounts just to get your number of accounts up. It looks like this screenshot is from Credit Karma. If so, you should know that the score they give is not the score that banks typically use when giving you credit. Some of their advice is good (get your utilisation rates down, limit inquires, etc) but I would completely disregard any advice over the number of accounts you should have. I personally have 31 accounts, which Credit Karma considers excellent, but I have been told by lenders that I have too many. Credit Karma's philosophy of "more is always better" is not shared by all lenders. With that said, lenders do seem to agree that it's low impact (I've never been turned down for credit), so it's not worth worrying over too much. Each account you apply for will require a credit inquiry, which will negatively affect your credit for up to two years. Spreading your balances over multiple cards instead of having one card charged up all the way might help your score. You may be tempted to charge up the cards, which will put you in an even worse position than you're in now. Any one of the above factors alone is a bigger deal than your number of accounts. If you're to open new accounts, do it only after considering all of the above. Personally, I wouldn't (and don't) even consider the number of accounts I have open. Nobody really knows what the proper number is anyway because the FICO formula is a secret. Also consider that you can get a lot of the same benefits by getting your limit raised on your current cards instead of opening new ones. Although you will probably still take a hit for the inquiry, other factors may make that worth it. If you are looking to raise your credit score, either short term or long term, then you should focus on getting your utilisation rate down. That has a huge impact on your score, much more so than anything else that's currently negative on your report. Pay those down as fast as you possibly can, and ask if you can get a higher limit. See if you can get a tentative approval before they run a hard inquiry against your credit report. You don't want to take the hit if they are going to turn you down. If you have any cards that you competely pay off every month, pay them throughout the month so that they get reported with a lower balance. You may also be able to mitigate it by getting a new card with a high limit. Another possible option is to get someone to add you as an authorized user to one of their existing accounts, assuming you know anyone that is willing and able to do so. In summary, forget your number of accounts and focus on lowering your utilisation rate. Have you clicked on "See details" by Total Accounts? I would guess that it tells you that you have too many accounts, not too few. The biggest impact according to that chart is your credit utilization. Getting that down to around 15 - 25% would probably help a bit, especially if you can do that on every account individually and not just your total utilization. The age of your oldest account is also an important factor, but there isn't anything you can do about that other than wait. You do have a lot of accounts considering your oldest account is relatively new, and that could be a bit of a concern, but 724 is still a good credit rating. The number of accounts has a 'low' impact per your report, the main benefit of opening new accounts would be that it decreases your credit utilization, which does have a big impact on your score. Even if you're disciplined about using your new credit cards, additional accounts may have to be used once in a while to avoid having them closed, so you'll have to keep track of what you owe each month on each account. You'll also want to check on them with some frequency to keep an eye out for fraudulent charges. Additionally, you might feel obligated to keep those accounts open in perpetuity, since closing them would hurt your score again (depending on utilization at the time). Those things aren't necessarily a big hassle, but if they have no real benefit then it's not worth bothering with. Rather than opening more accounts, you could ask for a limit increase on your current accounts, and focus on paying down what you already have. Credit utilization fluctuates a lot because it's utilization at a point in time, so if you have high utilization but most of it is on your credit card that you pay off each month, then your score will be significantly higher a few days after you pay it off, and if checked over the month it will drop down gradually as you increase the balance. While 750 is typically considered the dividing line between 'good' and 'excellent' credit, it would only matter for student loan purposes if you were trying to take out private student loans (and even then, could be no impact given the slight difference). If you're getting a Stafford, Perkins, or PLUS federal student loan, you won't get a better rate by having a better score. I've been profiting to a modest extent by taking advantage of 0% no-fee balance transfer and 0% no-fee purchase card offers for a long time now. Basically, use a 0% no-fee purchase card to buy everything until the month before the deal runs out. Put the money you have spent in an interest-bearing savings account. Worst case, you will then pay off the card in full and pocket the interest. That important bit, because a few years down the road you may want to apply for another "introductory" 0% deal from the same card company, and you can't do that if you already have one of their cards no longer in use. I don't know for how long they remember that you once had one and closed it and turn you down because of that, but it hasn't happened to me yet! Never missing a payment and occasionally paying off a card in full and then closing it seems to make you look like a good customer to the card companies. The other important thing (I'm told) is that if ever you are turned down, do not make another application for a good few months. If you make several applications in too short a space of time you look "desperate" and won't be offered the good deals. It's proverbial: a bank never lends money to anybody who looks as if he needs it! (I haven't yet found out how large a debt makes me look as if I do need it). These 0% deals will doubtless disappear if/when interest rates rise. On the other hand, if you can borrow at a low percentage APR and save at a significantly higher rate (net of taxes), it could still be worth doing. And of course, there's always the possibility that you actually need to borrow, in which case a good credit rating is useful. The most important bit, of course, is to put every penny you spend into that savings account, every month, so you do not become the sucker who cannot clear the debt when the 0% deals go away! Not the answer you're looking for? Browse other questions tagged credit-card credit-score credit credit-report credit-history or ask your own question. Opening 5 credit cards at once with no history to ruin, is it a good idea? 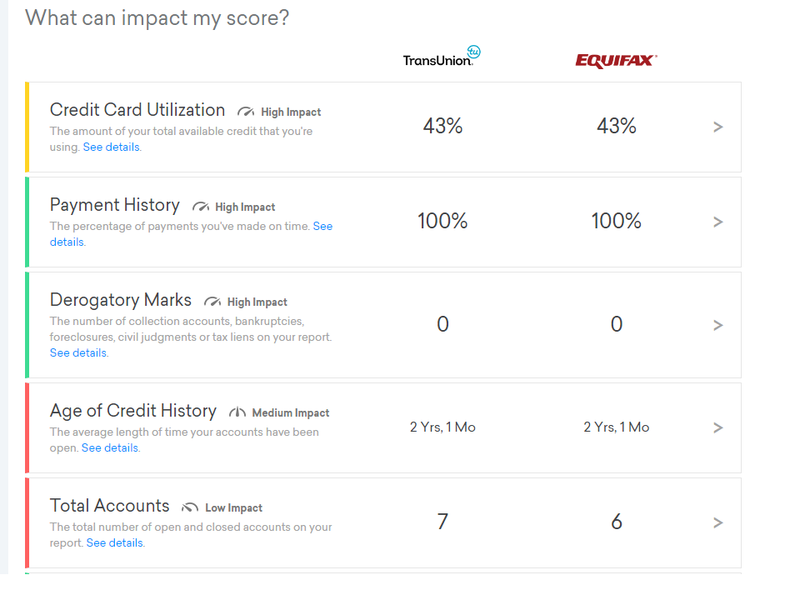 Why Am I Having Such A Hard Time Getting a Credit Report?